Oliver Peyton’s ICA Cafe and Bar is current and edgy, just like its ICA host. It's the ideal spot in which to enjoy informal drinks with friends in a cool environment. 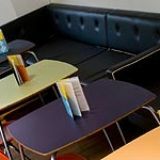 "The ICA Bar is a relaxed, spacious and effortlessly hip venue for cocktails, coffee and the odd cinema trip (perhaps with our exceptional burger, beer and cinema deal at £8.50 only)! Peyton and Byrne provide freshly baked cakes, pastries and a selection of fine loose-leaf teas in the café area. Classic European dishes are served for lunch and dinner respectively in our laid-back, minimal restaurant space… Though, if you’re looking to get the party started, our cocktails are as artful as the galleries’ contents, with the mezzanine bar open until 1am most evenings. 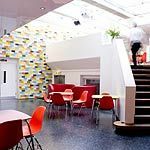 Inside London’s coolest contemporary art centre, The ICA Bar caters to the taste even the most discerning of culture vultures." What did you think of ICA Bar and Cafe? I love the ICA so much – it epitomises all that’s great about London. You get to mix with a cosmopolitan crowd, there are no suits or students and the whole ICA vibe is just enchanting. 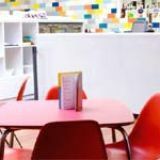 After receiving a very trendy makeover from the good folk at Peyton and Byrne, the ICA Bar and Cafe proves that the ICA isn’t just about fancy new art. 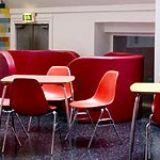 Boasting an association with something as innovative as the Institute of Contemporary Arts, the ICA Bar and Cafe has a lot to live up to and its recent transformation at the hands of Peyton and Byrne ensures you could quite happily ignore all of the art and go and get sozzled instead. It’s an impressive makeover, perfectly in keeping with the Institute and boasting a deliciously modern decor. A long walkway leads visitors seductively into the main hub where a large tiled rear wall shows off the fancy modernist motif. It’s predominantly simple with immaculate minimalism and plenty of space, whites and sweeping lines ensuring it’s reflective of the Institute itself. The main bar area is up a small set of stairs, illuminated by skylights and bright lighting, whilst the cafe is situated downstairs and kept nicely atmospheric with more moody lighting. It’s not just ICA visitors who you’ll see here. 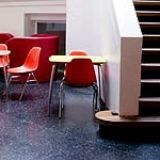 The ICA Bar and Cafe is trendy and central enough to act as a destination venue, and consequently you’re likely to see a host of creative and fashion types who clearly aren’t idle gallery visitors. The strength of the stylish atmosphere means that it’s conceivable that this place could be a fashionable hangout, transporting a little bit of East End cool to Central London. It can even get pretty funky in the evening so if you’re in there late make sure you’ve got your dancing shoes at the ready. Proof of the ICA Bar and Cafe’s foray into being somewhere to visit, as opposed to an extension of the Institute itself, can be found in its superb range of drinks. All the usual beer suspects are accounted for, and are kept very well on tap with some more exotic bottled options in the chiller. The cocktail list is sound, with a particularly delicious Mojito Royale - the addition of a little bit of good quality bubbly making a well made concoction even more desirable. What’s more, you might even see the confusing sight of one of the scruffy arty types ordering a bottle of Taittinger - who says you have to suffer for your art? An immaculate venue that complements the Institute well, the ICA Bar and Cafe could quite easily stand alone as a bastion of quality in even the trendiest parts of London.